I'm pretty pleased because for the first time ever the provisional cast on WORKED - I was able to easily unravel the cast on edge, and it left proper live stitches - i can't of course remember what I did, so this may be a one off, but hopefully something will have sunk in and I can get it right again! A new painting has been sketched out - my first attempt at painting fair isle, wish me luck! I'm featuring the Tam that I knit for my SIL Deb's birthday earlier this month. And something that I just love - the lace shadows that are cast on my window sills ... they always make me smile. That is stunning. Go you! I can't wait to see it in action. Oh WOW! The ice queen cometh! All hail to the ice queen! Ice queen is stunning, beads and all. I am SO impressed! Lots of good luck on the picture. That, plus your skill, artistic gifts, and years of experience, should make for a splendid painting. yay for you! It's beautiful. Well done on the prov. cast on. On the jacket, I had to snip mine out so you did something very right! And lace shadows are delicate and pretty, aren't they? Beautiful!! I always have trouble with the Provisional Cast on. I saw it on Knitty Gritty and I think I will use muh bigger wool and hook, and then I can really see the bumps on the back. I'm like Bells, always cutting mine out!!! The lace is lovely - both the ice queen and the shadows! New painting - yippee! 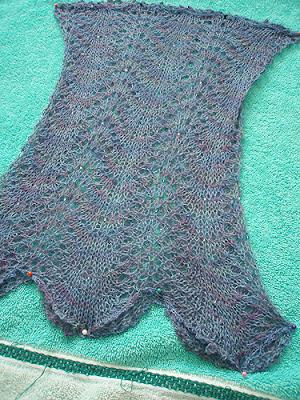 Fair isle will be a challenge I think but I'm sure you are up to it - I reckon if you can do lace, you can do fair isle! I love the light through lace curtains. There is something calming and peaceful about it. I can picture my grandmother sitting by a lace curtained window in the sun and it makes me smile. Your Ice Queen is beautiful! I always have to pick out the provisional cast on. Maybe there's a secret I just don't know. Great lacy stuff! 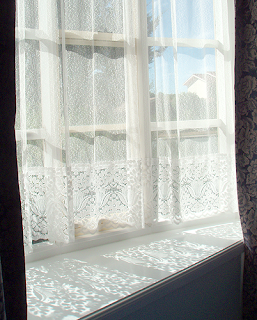 : ) That lace curtain and window sill would make a nice painting! 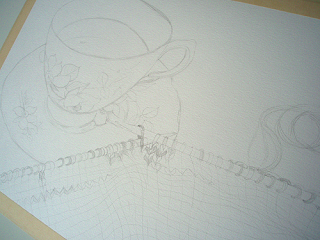 Add a cup of tea and a skein of yarn (what colors? pale blue? canary yellow? pastel purple?). Yeah, lovely lace. I really like Ice Queen, but I'm ready to think SUMMER. Now if spring would just meander in!